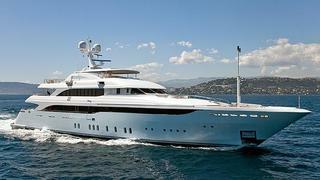 Burgess has listed the 51.8m motor yacht Victory for charter in the Mediterranean this summer. Delivered in 2007, she offers accommodation for 12 guests in four double and three twin staterooms care for by a crew of 12 headed by the charter-friendly Captain Andrea Arte. A large sundeck caters for all tastes with a Jacuzzi and shaded area for alfresco dining, while the yacht carries a wide range of water toys. Victory is available for charter at weekly rates starting from €250,000 in high season and €200,000 in low season.